Headaches are usually caused by either muscle tension, vascular problems, or both. 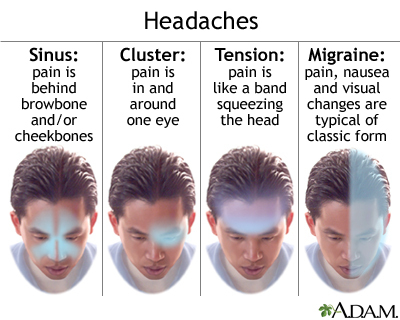 Migraines are vascular in origin, and may be preceded by visual disturbances, loss of peripheral vision, and fatigue. Most headaches can be relieved or ameliorated by over-the-counter pain medications. Reviewed By: Joseph V. Campellone, MD, Division of Neurology, Cooper University Hospital, Camden, NJ. Review provided by VeriMed Healthcare Network. Also reviewed by David Zieve, MD, MHA, Isla Ogilvie, PhD, and the A.D.A.M. Editorial team.